I build swiming pools for a living. High spec reinforced swimming pools. Many years ago, we built a swimming pool at Wall Park, Brixham. One steel fixer – Fred Jones from Flint, had some interesting stories about working on the construction of the Mulberry Harbours. He said the first ones were built with a flat bottom. On trying to float them, they had sucked onto the mud. The redesign was with a slatted base to make floating them off on the tides easier. You can find out more about Mulberry Harbours and Embarkation and the role of the New Forest during D Day by visiting our main page on D-Day in the New Forest. Thank you for your question and some further insight into Mulberry Harbours. 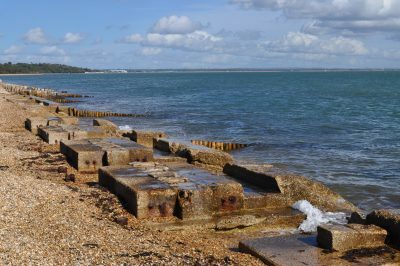 We are steadily amassing more information on the Mulberry Harbours as numerous components were built in the New Forest area. Numerous design drawings exist, but haven’t picked up anything on having to change the bottoms. As all parts had to be towed across I would have thought that this would have dictated some of the design elements.